It 's official: the new Thermomix TM5 arrived. for you and all members of the Dream Team Thermomix (Bimby)® there is a great news that will soon involve you personally. 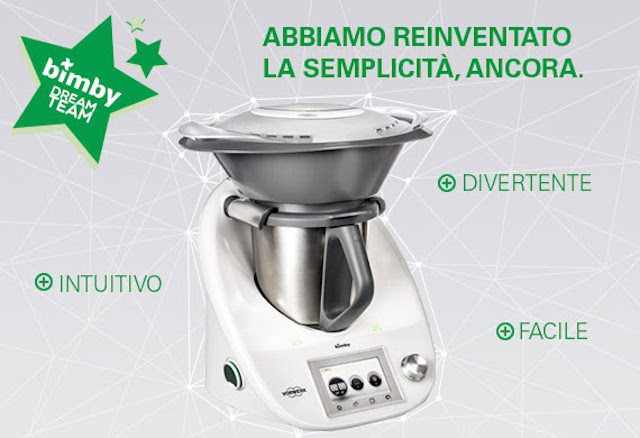 Today, September 5, 2014, for Thermomix® is an extraordinary day. In the whole world, just as you receive this mail, we are presenting the new Thermomix® TM5. It is an event dedicated only to our sellers, but to you, one of our ambassadors, we wanted to communicate a preview. And of course we want to invite you to touch it with your hands. We wait for you September 26 in order to know all the new features: you'll see how technological, fun and easy the new Thermomix® is. You can not miss this event! Your support in this year of great change will be even more essential and you will become even more important for the world Thermomix®. Presented by an intriguing trailer, the new Thermomix TM5 fully corresponds to the picture that has been circulating for a few weeks. For the rest, Thermomix® is always himself, with the Varoma, the butterfly, the spatula, the basket. In Italy the official launch is scheduled for September 26: can't wait any longer...! Whatever the new version is, I know for, a fact, that the Thermomix is always a Thermomix! A friend of mine has still a 30 years old model. My mom has a TM21 for almost 20 years and does not want to change it: she knows how to use it very well! The TM31 is fantastic, will have a long life and together we will continue to experiment many recipes. And in the meantime ... I'm ready to start the discovery of the new born! To find out more browse the Official Thermomix Site.